A common scenario that many of us gardeners face is having plants the needs to be consistently watered and cared for. At some point, taking care of such plants do feel like a heavy burden, especially when one needs to go for long holidays and cannot find someone to entrust the watering and care to. Thus many turn to cacti and succulents, or commonly called xeric plants, as an alternative to more water demanding plant. Alas, many xeric plants are not that showy, nor easy in more humid tropical region, as they possess Crassulacean Acid Metabolism (CAM) that requires cool nights (think of the desert temperatures at night) and grows ever so slowly. There is, however, one rewarding and showy 'desert' plant, and not only does it grows fast, it also has lovely caudices that can be a focal point and possesses stunning blooms too. 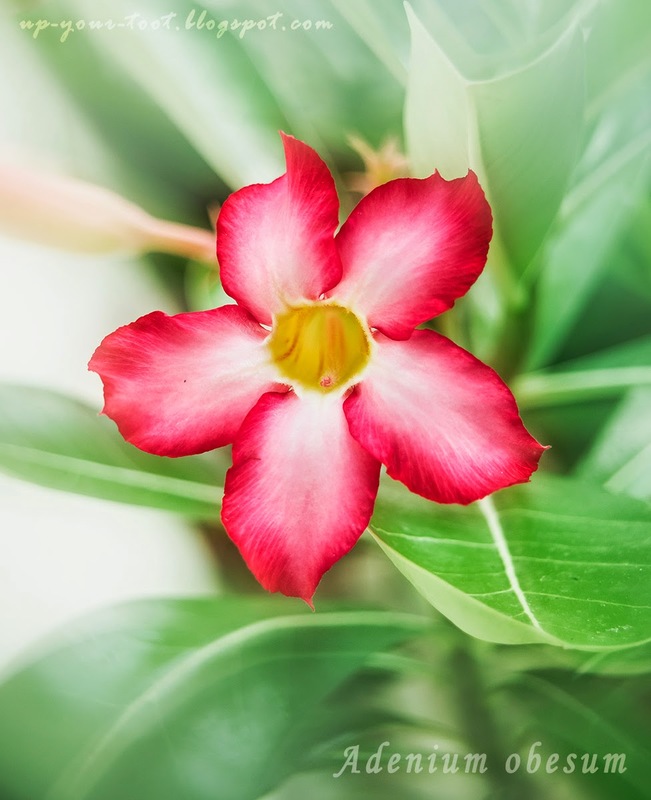 This is none other than Adenium, a plant genus of 10 or so distinct taxa (species and subspecies) belonging to the dogbane, or Apocynaceae family. 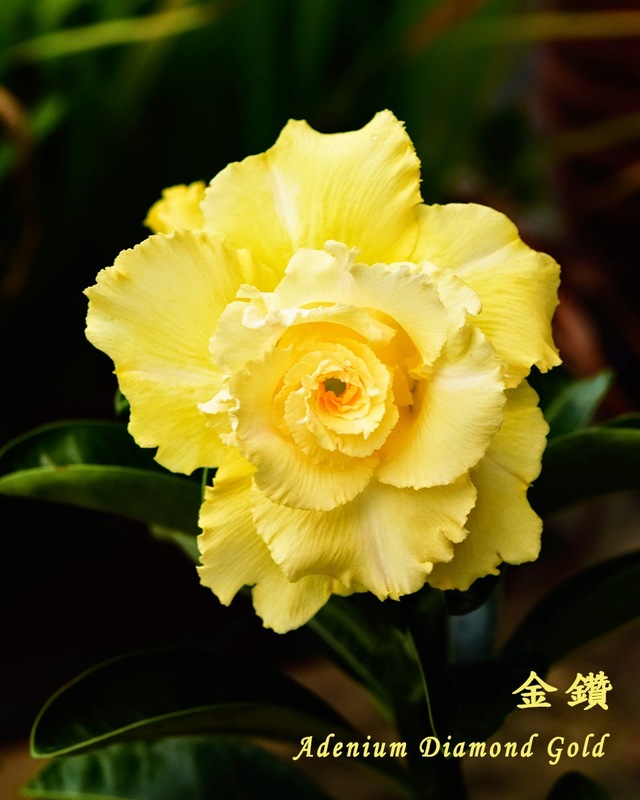 The common type Adenium obesum - they are called 富贵花 (Prosperity flower) by the Chinese, and hence very popular at one time. Popularly called Desert Roses, Adeniums are actually mesic plants (plants that require moderate amounts of water) that have adapted to xeric (dry) conditions. Unlike xeric succulents that utilises Crassulacean Acid Metabolism (CAM) in photosynthesis, Adeniums are C3 plants, like many non-tropical plants. Indeed Adeniums truly are deciduous plants with water storage organs, namely the caudex and fleshy roots and stems. Hence they appreciate ample amount of water when actively growing and little water when resting (like many deciduous plants). Due to the fleshy nature of their water storage organ, excess water during resting, leafless stage will invariably lead to soft rot and damaged caudices. Hence the growing media should be open and porous, whilst still retaining moisture as this encourages strong root and shoot growth that helps the caudex to grow. 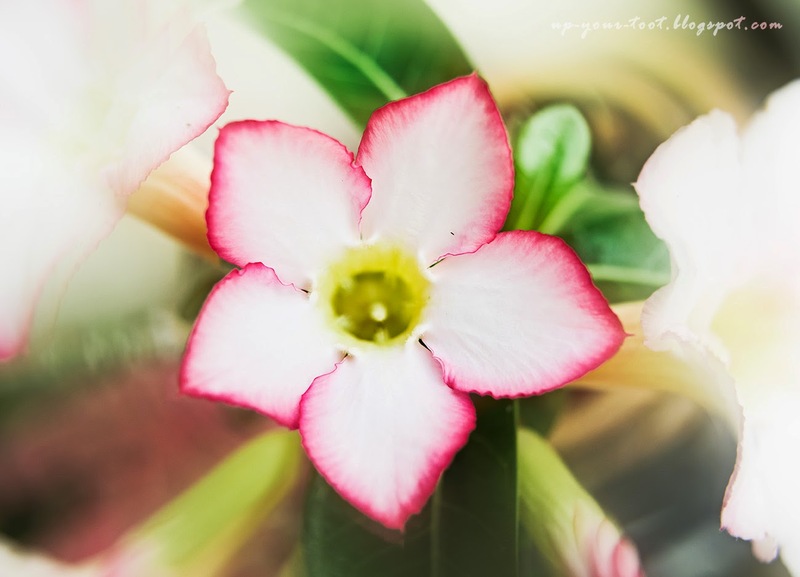 Another hybrid of Adenium. This is an unnamed cross that was available on a local nursery. Love the thin red line on the edges. Whilst the original species of Adeniums comes only in shades of pink and whites, and only single-petaled flowers, hybrids nowadays comes in a multitude of hues (with the exception of true blue), including black. 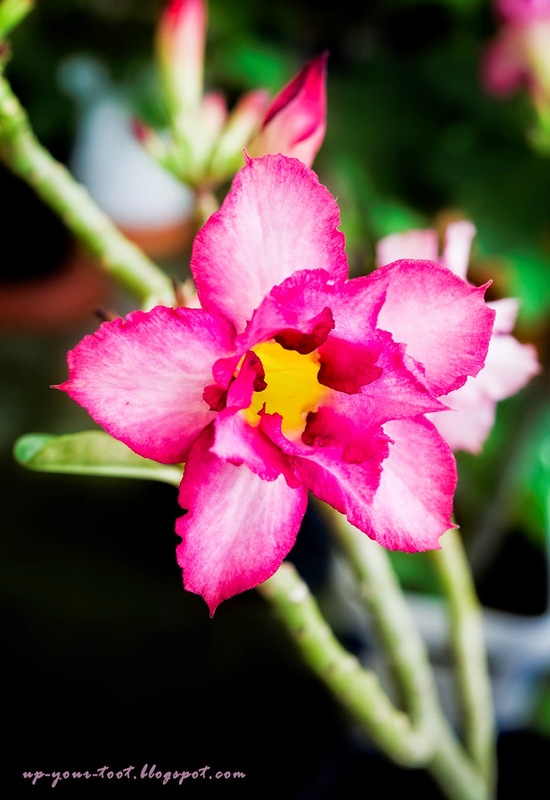 Double forms of Adenium flowers, also known as Rosy Adeniums, ranges from double to rose-like multipetaled blooms. 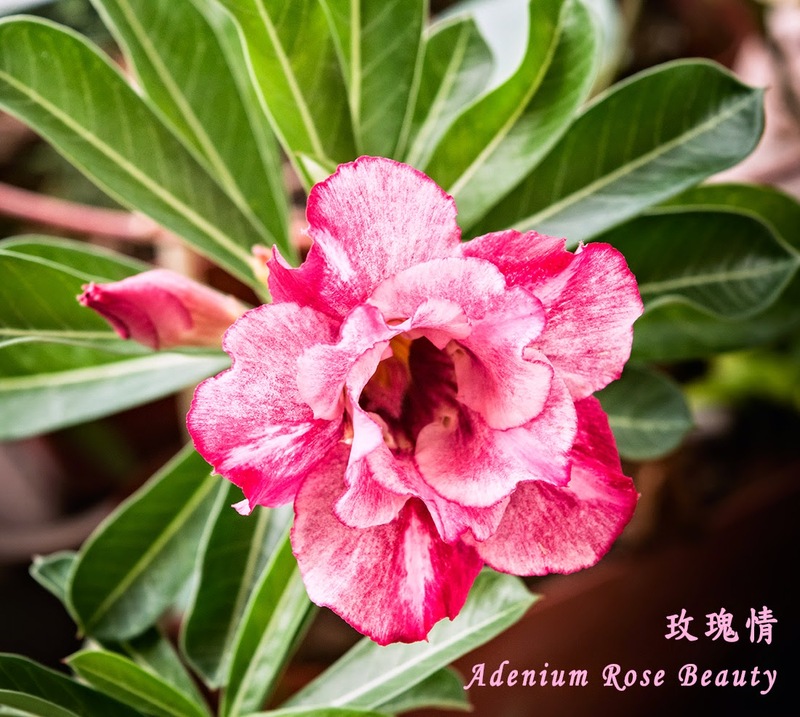 Adenium Rose Beauty is one of my favourite Taiwan-bred rosy Adenium hybrid. The flowers have good form, are held at facing upwards (not droopy), and the petals are tough with the blooms lasting at least a week. They also come in gorgeous orange-peach tones like this one, aptly named 'Gorgeous' by the hybridizer. 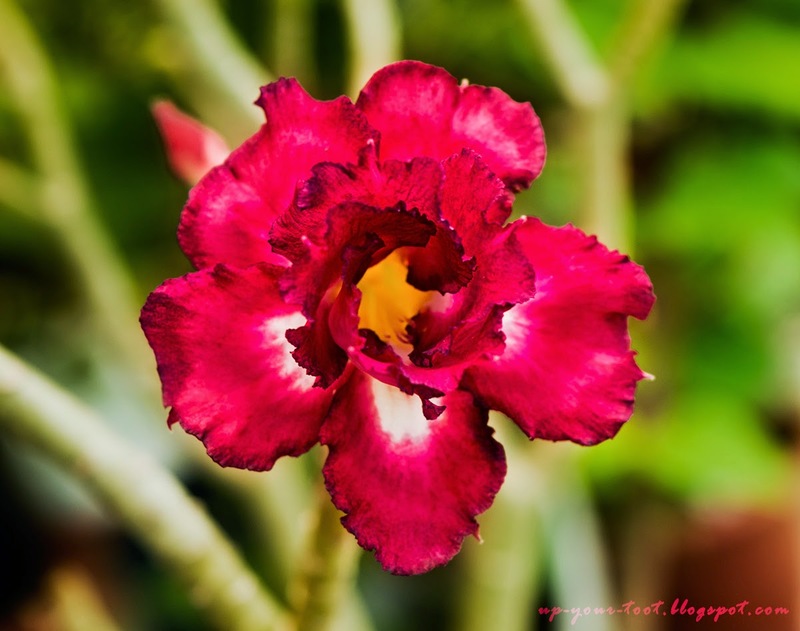 A magenta-red double layered rosy Adenium. This one is a rather prolific bloomer, and set seeds easily. 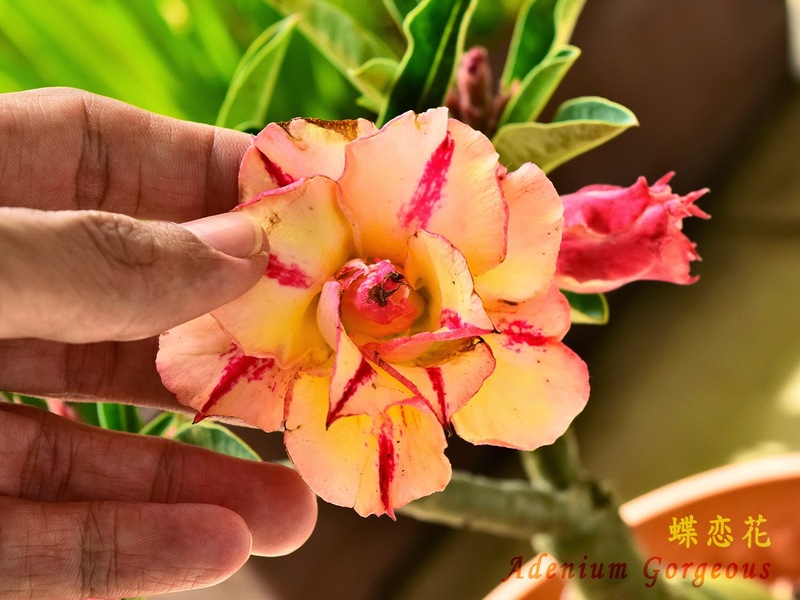 Adenium Gold Diamond has lovely rose-like blooms, as long as the buds are not damaged by insects or fungus or the weather. As with many pale-coloured and yellow Adeniums, the buds tend to 'blast' or burn-out and turns into an ugly blob of brown mess. On the plus side, this hybrid is very floriferous and will keep on throwing out buds even under dire conditions, and the flowers have a strange (or wonderfully creepy) scent of Wrightia/Plumeria past midnight. 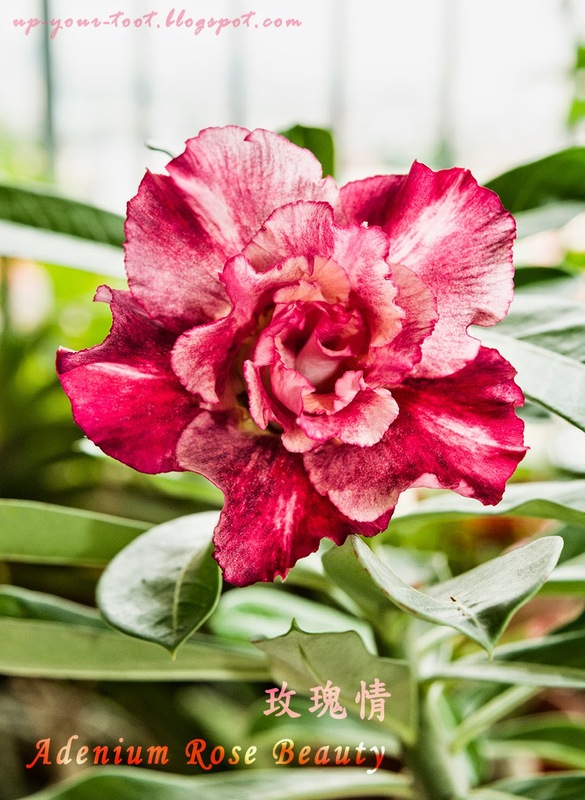 Thailand, Taiwan and India are the centres of rosy Adenium hybridization, with the world mostly seeing Taiwanese and Thai Adenium hybrids. The Thais are also well-known for producing various tree and bonsai-like shaped forms that are truly amazing and a sight to behold, especially when they go into full bloom with no leaves. 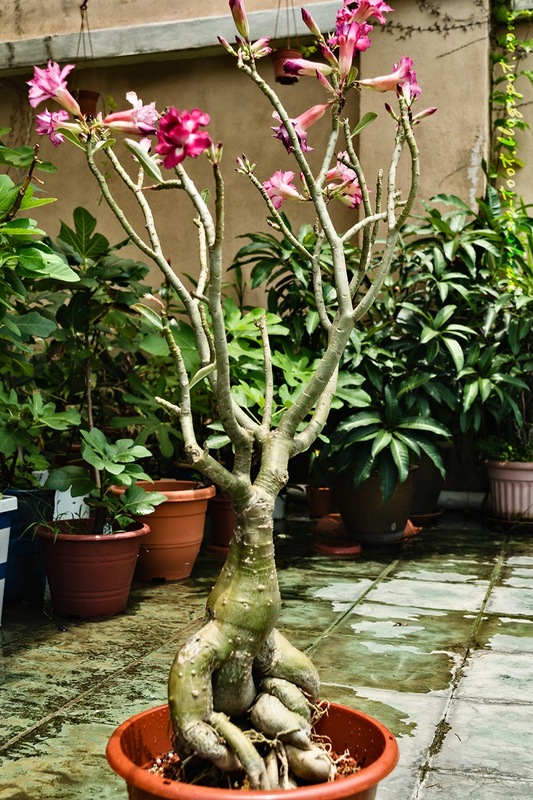 A good example of a Thai tower Adenium forms. 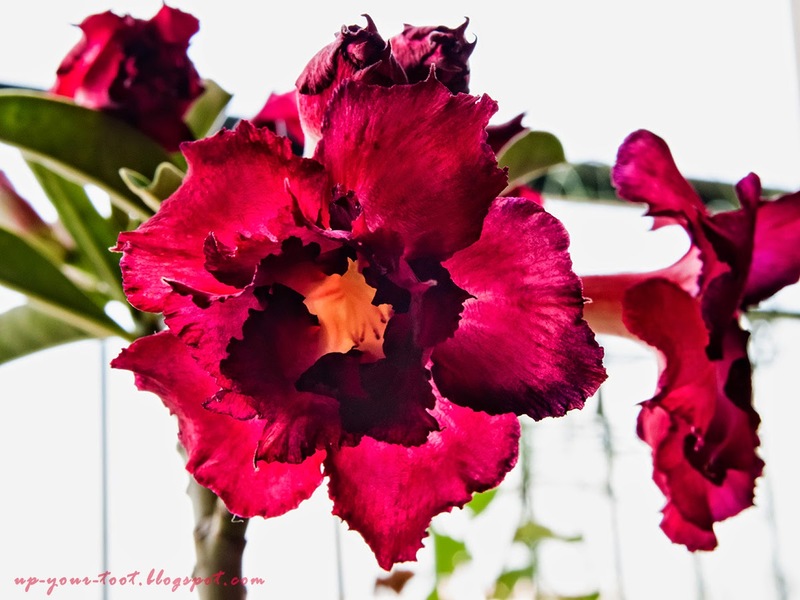 They are hybrids or selections of Adenium somalense var somalense and some of them are call Anaconda. This specimen is about 6 feet tall, and the base of the trunk is thicker than my arm. 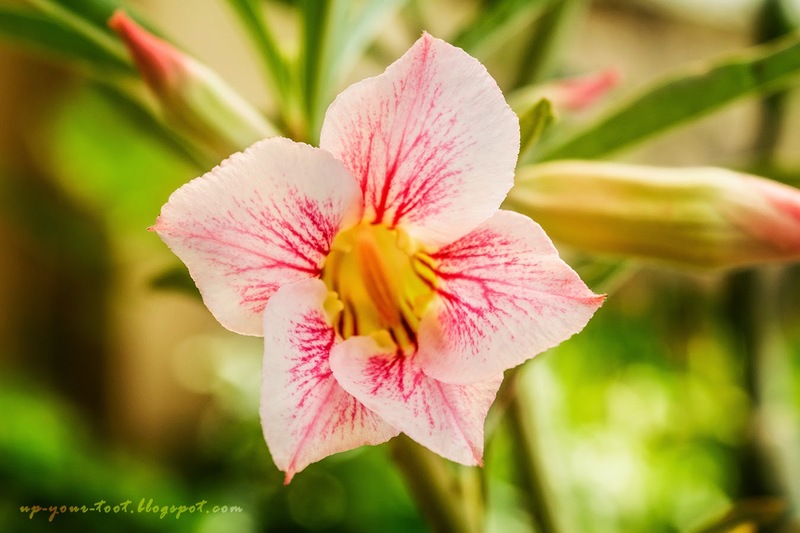 The flower above are from a seedling - very dainty despite the small bloom size. 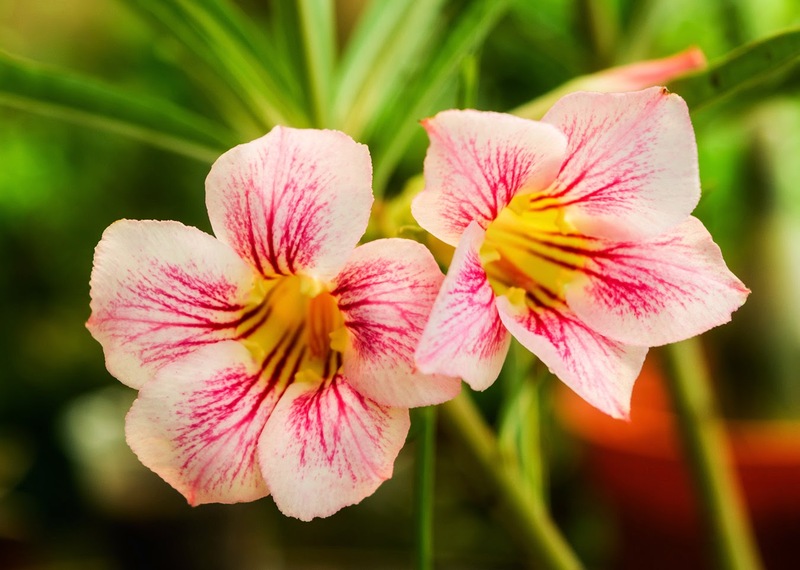 The lines down the throat of the flower and the shape of the leaves on the plant hints of a strong Adenium crispum parentage. The plants are also very diminutive in stature, a complete opposite of the tower forms above. I believe this is an old rosy Adenium hybrid called Purple Rain. They have flowers that range from carmine red to lilac purple and changes colours as the blooms age. The shape is also variable and can be rose-like or pointy stars. 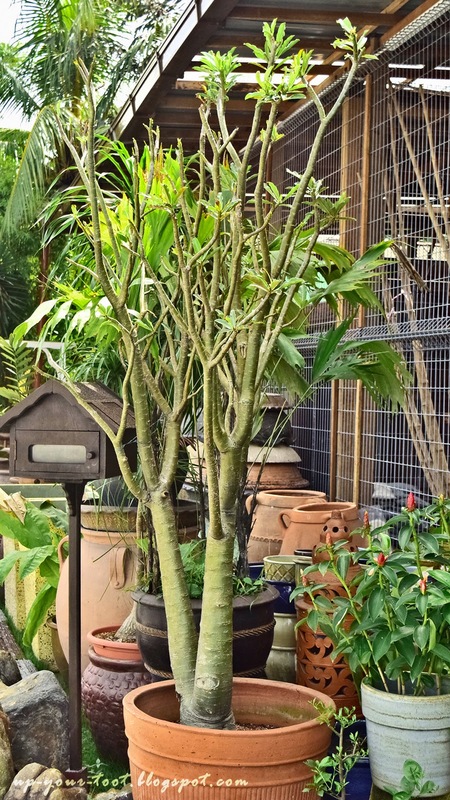 The raised caudex of an Adenium. Growers will usually raise the plant an inch or so higher each time they re-pot the plant. This forces the plant to put the roots further down and help show off the swollen caudex and roots better. So if your garden needs something unique, something bright and something easy to care for, do give Adeniums a go, for they will reward you with great joy with less worries than many other flowering plants. Just remember, lots of sun and water when actively growing, keep on the dry side when no leaves showing. Ah thanks for the tips. Next time transplant hope remember to plant the root a bit higher than usual. Baru ada 3 small plants of desert rose saje cuba cuba . Think one of it is charming. Ok sure. Tak pergi Floria ke?